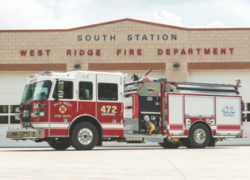 The West Ridge Fire Department responds to your need for fire, rescue and emergency services. Our department strives to provide you and your family with the most efficient and professional services possible. This is accomplished by using the most modern equipment and technology. Protecting lives and property is what we do. Your financial help is what we need. The volunteer members are on call 24 hours a day, 7 days a week. The part time members are on duty Mon. through Fri., 8 am to 6 pm (excluding holidays). Whether the alarm sounds at 3am or 3pm, the members leave their families, homes and job to answer what ever the emergency call is.